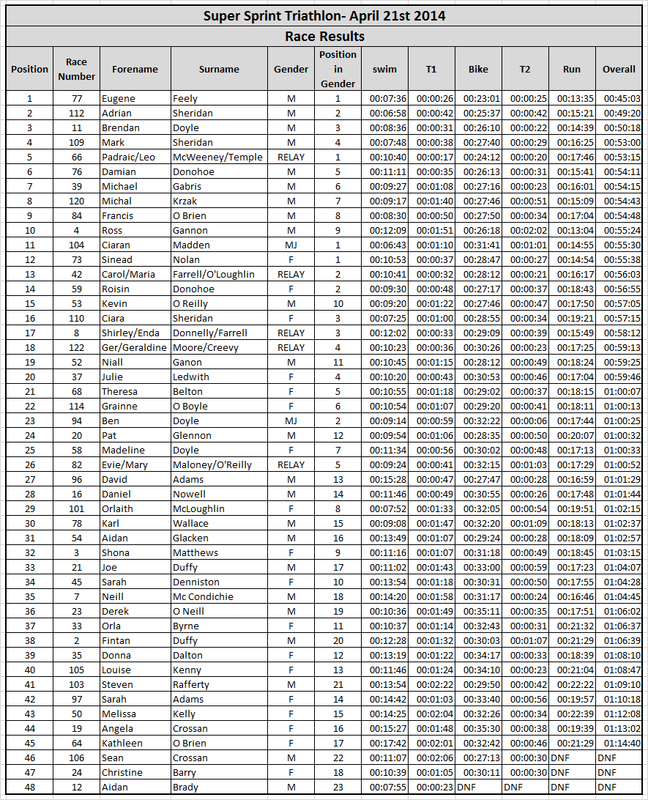 The 2014 Super Sprint male and female bar was well and truly risen with the male course record up by 4 min and 47 sec and the female course record up by 2 min and 54 sec. Adrian Sheridan was unlucky with bike trouble but still managed to beat last years course record, but this still wasn't enough to hold off Eugene Feeley time of 45:03. Roisin Donohue also had a great race and improved on her 2013 first place record time by 1 min and 37 seconds but Sinead Nolan was out to win with a very strong run time of 14:54 to come home in first place with a time of 55:38. It was also good to see the new addition of two junior competitors Ciaran Madden and Ben Doyle. Ciaran had the best swim of the day in a super time of 6:43.